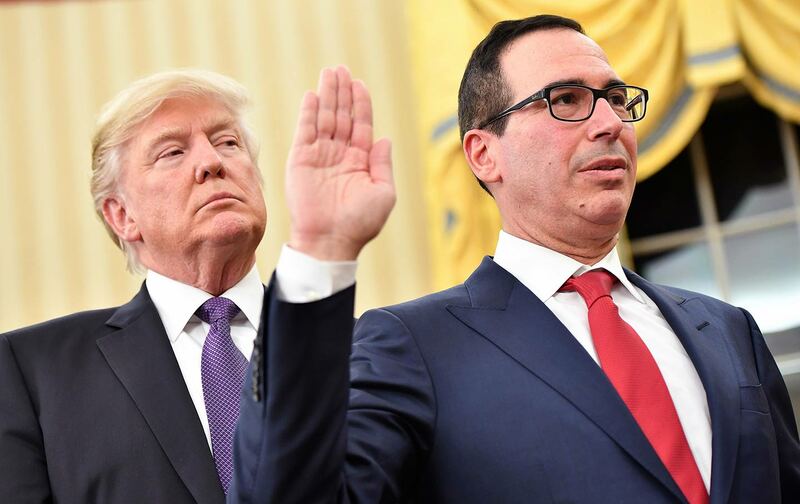 Treasury Secretary Steven Mnuchin doesn’t exactly come across as the guy you’d want in your corner in a playground tussle. In the Trump administration, he’s been more like the kid trying to cop favor with the school bully. That, at least, is the role he seems to have taken in the Trump White House. When he isn’t making the rounds of the Sunday shows to stooge for the president, he regularly plays the willing fall guy for tax policies guaranteed to stoke further inequality in America and for legislation that will remove just about any consumer protections against Wall Street. Mnuchin, a former Goldman Sachs partner, arrived in Washington with a distinct reputation. Back in 2009, he had corralled a bundle of rich financiers to take over California’s IndyMac bank, shut down amid the 2008 foreclosure crisis by the Federal Deposit Insurance Corporation. Bought for $13.9 billion (but only $1.3 billion in actual cash), Mnuchin turned it into a genuine foreclosure machine, in the process sealing his own fate when it came to his future reputation. At the time, he didn’t appear concerned about public approval. Something far more valuable was at stake: the $200 million that, according to Bloomberg News, he raked in personally, thanks to the deal. Since Mnuchin bagged one of the most influential economic positions on the planet, he’s been remarkably consistent on just one thing: making sure he lends a helping hand to the world of big finance, his former universe. He has, for instance, pushed hard for more bank deregulation by claiming that it will help the smaller banks. Don’t believe it for a second. His disdain for reenacting the Glass-Steagall Act, which once made the merging of commercial- and investment-banking operations illegal and so curtailed the too-big-to-fail status of the largest banks, tells you all you need to know. It reflects his real thinking when it comes to banks and the stability of the economy. Emblematic of this has been the way he steered the Financial Stability Oversight Council that he chairs to give AIG, the insurance company at the core of the 2008 financial meltdown, a gateway back to prominence by removing its “too big to fail” label. In other words, this is a man who has a real sense of the opportunity that’s embedded in this moment—for the large banks and their CEOs to make a bundle of money—but no appropriate sense of the risks involved or fear for a future in which he and his president might find themselves bailing out such banks, 2008-style. Mnuchin may have little grasp of what constitutes real risk, but he can still make threats about it. In an October interview with Politico Money, he credited the stock market’s post-election rally to positive expectations that Congress would pass a major tax-“reform” bill. If that bill doesn’t go through, he warned, the markets will suffer big time—and so will everyone else. Coming from a Goldman Sachs alum, that should have rung a few bells. After all, in the fall of 2008, with the stock market tanking and banks imploding, then–Treasury Secretary and former Goldman Sachs CEO Hank Paulson took a similar position with House Speaker Nancy Pelosi. Following that chamber’s initial rejection of a $700 billion bank-bailout bill that sent the markets into a tailspin, he warned that, if she didn’t get it through, the big banks would stop providing money to the American public. Sure enough, Congress complied. With 91 Republicans joining 172 Democrats, the bill passed by a vote of 263 to 171. Actually, the math isn’t hard to do at all. My 8-year-old niece could do it. If you make more than a certain amount, your tax rates shouldn’t get cut. That’s the only math that makes sense. But in the land of tax subterfuge, even if you leave a top tax bracket rate as it is, you can still ensure that the wealthy get all the breaks in other ways. On November 2nd, the Republicans finally released their “Tax Cuts and Job Act,” which contained new blows to middle-class well-being, including the elimination of deductions for medical expenses, student loan interest, and state and local taxes. For corporations, already flush with cash, the plan calls for a significant, not to say staggering, tax break. Their tax rate would be slashed from 35 percent to 20 percent. And don’t forget repealing the estate tax, that other classic benefit for “the masses.” Count on one thing: There will be no reversals from Mnuchin or Trump on that, because the math couldn’t be clearer. Only the hyper-wealthy have estates big enough to reap rewards from such a change. At an Institute for International Finance conference, even Mnuchin had to agree that this was a benefit of the rich, by the rich, and for the rich: “Obviously, the estate tax, I will concede, disproportionately helps rich people.” Indeed, the heirs to the estates of fewer than 1 in 500 Americans who die each year would benefit in any way from such a repeal, though the children or other relatives of 13 of the 24 members of Donald Trump’s cabinet and the president himself would bag a collective estate tax break of about $1.5 billion. Donald Trump, of course, campaigned as an anti-establishment candidate who would offer a hand to regular people, drain the Washington swamp, and have our backs. Then he promptly began filling his administration, especially when it came to the economy, with the richest of the rich, figures guaranteed to promote the dismantling of whatever tepid regulations remained to protect citizens from economic disaster while enriching the usual .01 percent. Mnuchin has yet to even do something as simple and seemingly straightforward as posting a full-scale explanation of the tax plan he’s plugging so hard at the Treasury Department’s web page. Even though until November 2 it remained a chimera, that hasn’t stopped him from rushing to its defense—the defense that is, of giving the extremely wealthy yet more of their money back. Welcome to the 21st-century American politics of the .01 percent. Mnuchin himself knows a situation ripe for the picking when he sees it, in government or out. Take, for instance, his prodigious use of military planes for his personal travel, both on government business and for pleasure. These flights have pushed the boundaries of judgment, if not legality. According to a report from Rich Delmar, the counsel to the Treasury Department’s inspector general, Mnuchin took military aircraft on at least seven occasions without obtaining appropriate authorization, skirting a “rigorous” preapproval process established to avoid undue use of such expensive amenities. And though he withdrew a request to take his wife on their honeymoon to Europe last summer by military aircraft, he did use an Air Force jet to fly to Kentucky with her to watch the solar eclipse and—he carefully added—to “review the gold” at Fort Knox. Unlike Health and Human Services Secretary Tom Price whose government aircraft fetish cost him his job, Fort Knox covered the solar eclipse for Mnuchin. In addition to those flights, Mnuchin has been flying high as a kind of second Kellyanne Conway on all sorts of non-Treasury-related topics that threaten to eclipse his boss. With Trump embroiled in a bitter war of words with National Football League players taking a knee over racism, Mnuchin saw an opportunity and cruised the Sunday talk-show circuit attacking the players. He used his platform to insist that they should “do free speech on their own time”—“off the field,” not on it. While the head of the Treasury isn’t an elected official, his words do hold considerable weight—and he is, after all, fifth in the line of succession for the presidency. The value, insights, and credibility of the Treasury Department impact economies, markets, investors, and confidence the world over. For him, as for his boss, whatever anyone says, their allegiance remains simple and clear: It’s not to the middle class; it’s to their class, the half-billion and up folks.